My flight from Toronto lands in Calgary a few minutes late at 1:00AM local time, but no biggie since my flight to Victoria doesn’t leave until 7:00AM. There are seemingly endless passageways to get from the gate to the terminal building, and there are no staff around to direct us. Once in the terminal, there are precious few signs to help us find our way. The airport is going through a major expansion, but they need to do better. 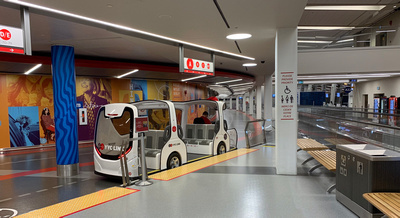 A YYC LINK electric tram pulls up and the driver offers to take me to the domestic terminal, which is where I need to be for my next flight. After being dropped off in Terminal A and before I find my gate, I spot an A&W which is open at this late hour, so I stop to have one of their new Beyond Meat Burgers, fries and a root beer. It has been 12 hours since I’ve eaten a real meal, so I find the veggie burger quite tasty! I walk further down the virtually empty terminal and easily find my gate, where I flop down for a couple of hours’ sleep. Of course I’m exhausted, but by 5AM the Starbucks adjacent to the gate opens, so I have a Tall Cappuccino, which perks me up a bit. By 5:30AM passengers and staff start showing up at the gates, and some early flights are being announced. The flight to Victoria leaves a few minutes ahead of time, with flight time estimated to be about an hour. 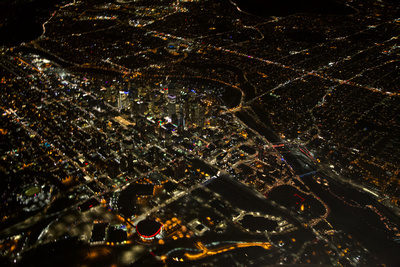 I take some nice shots out the window of downtown Calgary and the Bow River at night. The onboard WestJet Connect Internet is working, so I can keep myself busy on this short flight home. We start our descent into Victoria 125 miles out as the First Officer announces landing at 7:25AM local time in Victoria. We arrive at Victoria airport 17 minutes ahead of time in pouring rain and some gusty wind. I take a taxi home instead of the shuttle, since the weather is so bad. I’m looking at 24 hours of elapsed time between leaving Barbados and arriving home in Victoria, Canada. I have a midnight to 7AM layover in Calgary, so this whole flying home trip will be an endurance contest. I know I’ll settle down once I return the rental car and find my gate at the Barbados airport, but I’m experiencing pre-trip jitters this morning. I have a shower mid-morning and a snack before loading my big bag in the trunk of the car. I check out at Noon, drive to the airport and have the car filled up at the Esso gas station before dropping it off in front of the terminal. The Stoute’s car jockey gives an enthusiastic wave to the woman behind the counter, so I’m free to go! I’m first in line for the bag check at the WestJet counter – a nice young man tags my big bag through to Victoria and prints out my boarding passes for me. I have already checked in online and have the electronic boarding passes on my iPhone, but I’ve found the paper ones are still the best to use, and scan quicker at the gate. Before I enter the secure area, I have to exit Barbados by giving the immigration officer my Departure Card, which was issued previously when I entered Barbados after debarking the Royal Clipper in Bridgetown. Barbados to Toronto – Although I’m over two hours early, it isn’t long before the WestJet Boeing 737-800 arrives at the gate and passengers from Toronto enter the terminal. Our aircraft boards passengers from the front and rear doors using stairways from the apron (see banner image above), since Grantley Adams International airport doesn’t have jetways. 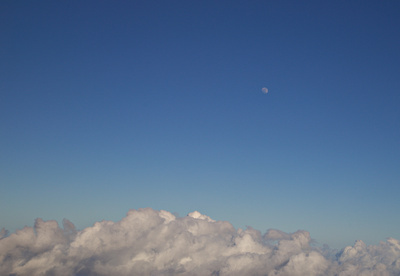 Just after takeoff, there is a gorgeous view of the old Moon in the blue sky during the day over the south coast of Barbados as we make the turn to the north. I’m in seat 5A – the same seat I flew down in on all three flights to Jamaica, and ditto on my return flights home. Hey, I like a window seat just forward of the wing, I’m only a row away from the Premium cabin, and I get to use the forward washroom. I splurge and purchase 24 hours of in-flight Internet service for $35 with WestJet Connect Internet, so I won’t be bored on these tedious flights home. I enjoy myself using the Internet while flying to Toronto. It certainly has some latency, but is usable for most of the flight. It does cut out once in awhile and then has to reacquire a signal. Once we are levelled off, I order the Butter Chicken dinner, which is not too big, but very tasty, costing $9. The flight crew on this flight give everyone much better service than on my flight to Jamaica. 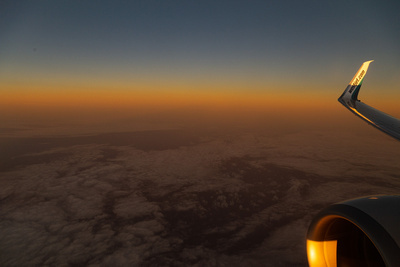 There is a beautiful display of colours over the Atlantic to the east as we fly offshore from the Bahamas at sunset. We are flying at 36,000′ according to the flight map displayed on the WestJet app on my iPhone. 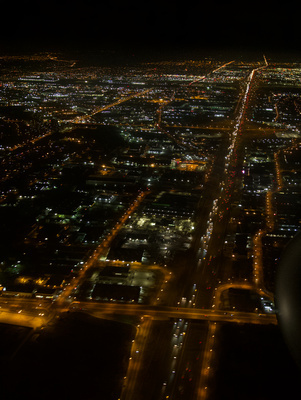 The aircraft makes a wide, sweeping approach over Toronto before landing, affording beautiful nighttime views of the city. However, after landing at Toronto’s Pearson airport, the marathon starts. I have only an hour to go through Canadian immigration and customs, retrieve my checked bag, find the WestJet transfer desk to put my checked bag back in the system, go through security again, and find my gate. Finding the single elevator that takes us to Departures is a challenge, however I arrive at my gate five minutes before boarding begins. I’m in a real state by the time I sit down for a few minutes to calm down before my group is called! Toronto to Calgary – After all that stress, the flight is late leaving. Flight duration is estimated to be 3:35, and the flight level 36,000’. The Internet access isn’t working since we took off about a half hour ago, so I raise my concern with the head flight attendant. She promises to “check with the guys”, which I take to mean she will talk with the pilots about the problem. Nothing comes of it, and the Internet is not available for the whole flight. We fly for what seems endlessly across the frozen prairie, which is visible tonight due to the bright illumination from the Moon. After yesterday’s stressful road trip to the Harrison’s Cave, I decide to take a day off from driving in favour of relaxing at my rental. Since the pool area was serviced yesterday, I go for a swim this morning while it is still relatively cool. Of course I have the pool to myself, except for the woman sweeping the decks and walkways. I enjoy a post-swim Banks lager beer on the patio while there is still shade this morning. I get my suitcase out and pack most of my stuff that I don’t need for tomorrow. I decide to take some of the unused food home with me, including the Traditional Bajan sugar, West Indies espresso coffee, a tin of Planters peanuts, and the two chocolate bars from Antigua. I don’t normally buy souvenirs when I travel…my photos and video are my travel keepsakes! 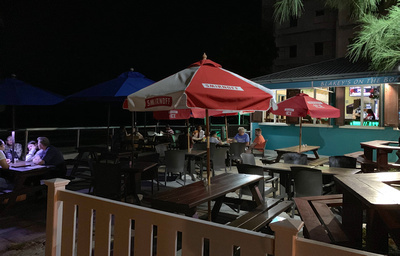 This evening I return to Blakey’s Bar & Restaurant, beside the Hastings Rocks boardwalk for my last dinner in Barbados. 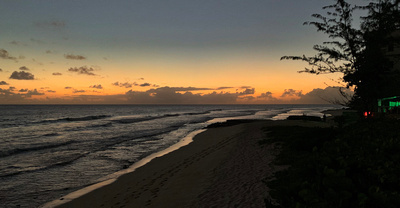 The post-sunset view of the beach is awesome, and I’m especially appreciating the warm ocean breezes, since this will be my last evening in the tropics before returning home. I have a Tanqueray Gin & Tonic to start, but like the Martini I had here a couple of nights ago, it is poorly made, but at least it’s cold. 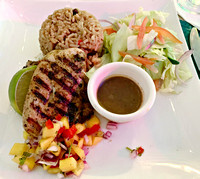 I have the grilled Mahi-mahi special, served with pigeon pea rice and two salads – excellent! I wake up far too early this morning at 7AM, but get up and make some coffee and have a light breakfast. I try to motivate myself to get out there today to see the sights, finally deciding to see the Harrison’s Cave. I call them to find out when their least-busy time is. I’m told that afternoons are best, but I must arrive by 3:30PM at the latest, which fits with my plans to chill out this morning. There are signs of life today in the rental complex, when the gardeners and pool service workers show up this morning to clean the pool and tidy things up. The only other humans in the complex are in the unit near the entrance, who have a Christmas tree up in their living room and a car parked outside. The other eight units appear to be unoccupied, although everything is tidy and well-cared for. There is also a construction crew doing a renovation of one of the units near me, but they don’t make much noise and only stay a few hours each day. I make myself some lunch and then leave for Harrison’s Cave around 2PM. It is a tortuous route to climb uphill out of my neighbourhood, since access to the highway involves negotiating a double switchback! It’s easier once I’m on the highway northbound, although the roundabouts in Barbados give me fits since they operate by different rules than I’m used to in Canada. Once I turn off the highway to climb uphill to the Harrison’s Cave, I’m back onto what are euphemistically referred to as “highways”, but are really just rough back roads. 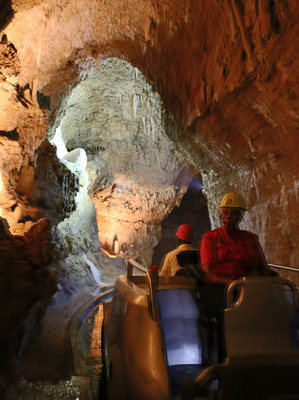 The last time I was in Barbados and experienced the Harrison’s Cave was in 1981, the same year they opened. This facility is now owned and operated by the Barbados government, and is pretty well developed. I pay BD$60 (US$30) admission for the last Tram Tour for today leaving at 3:45PM, so I have time to spare. Instead of taking the fancy new elevators to the gully area, I walk down the short trail to the Interpretation Centre and check-in. I take some good photos both from the tram and on the two instances when we get off to view water features and galleries. I chat with a couple who were on the Royal Clipper who are also on the tram tour. Unlike other Caribbean islands which are volcanic, Barbados is formed by limestone resulting from coral reefs on the seabed being heaved up by the collision of the Atlantic and Caribbean tectonic plates. This explains why the island juts out into the Atlantic Ocean, and why these limestone caves formed. The return drive to the south coast is pretty stressful, since I have to cope with rush hour traffic on the highways, and have to negotiate narrow, rough roads to return to my rental. Thank goodness for Google navigation! I have a beer beside the pool and make myself a simple pasta dinner, preferring to not go out this evening. I have nothing planned for today as far as sightseeing goes, but I go for a drive this morning. First stop is Hastings Rocks Beach, which is only a couple of minutes’ drive from where I’m staying, and offers a public access beach, a boardwalk along the beachfront, and easy parking. There are also lots of restaurants in the area, which I’ll make use of for dinner each day starting today. 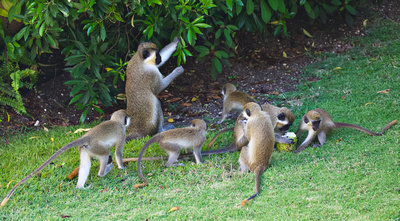 After I return to my vacation rental, I see a troupe of Barbados Green Monkeys roaming around the yard and feeding. After my previous encounter with hostile monkeys in Borneo, I am very cautious around these ones. They appear to be somewhat scared of humans, so they keep to themselves, which is reassuring. This afternoon I drive to the Massy Stores Supermarket in nearby Worthing to buy more food and beverages for snacks, breakfast and lunch. I go out for dinner to Blakey’s Bar & Restaurant, which is beside the boardwalk on the Hastings Rocks beachfront. I order grilled Barracuda, the catch of the day and a new fish for me to try. It’s quite good, but it could use a bit more spice, since it’s a very mild flavoured fish. I also order a Martini, which is barely cold and not well-mixed. I should have known better and ordered a Gin and Tonic or beer instead, but I enjoyed the meal and watching the sunset over the beautiful Caribbean. I wake up at 6:30AM as the Royal Clipper enters Bridgetown harbour and docks. It takes until 8:30AM for the ship to be cleared by customs and immigration. I don’t have to rush, since my airport transfer is scheduled between 9:30AM and 10AM. I go to the dining room and have an omelette and coffee with my friends, and say my goodbyes to them. I then leave the ship for the last time, retrieve my big bag in the cruise ship terminal, and clear customs and immigration. There are three big cruise ships in port in addition to our tiny ship: P&O Azura, Seaborn Odyssey and Norwegian Escape, so there are lots of people in the terminal, and it’s a bit chaotic. That said, the Barbadians are well-organized, and keep people moving onto their tour buses. I have pre-booked a van transfer direct to the airport, so I can pick up my rental car for the next few days I’m spending on Barbados. Once everyone checks in for the van, we are away from the crowds and down the new highways that have been built since I was last here in the mid-1980s. I’m dropped off at the end of the airport terminal where Stoute’s Car Rentals is located, and sign for my rental car – a Mazda 3, which is considered a full-sized car in Barbados! I drive to the Lantern’s Mall on the main road in Hastings to hang out for a couple of hours, since I’m too early to check into my vacation rental. There is a Royal Bank ATM in the mall so I withdraw some Barbados Dollars, have a small pizza for lunch, and also have a cappuccino later on while I catch up on social media using the coffee shop Wi-fi. I also purchase a few snacks and some beverages at a convenience store to take with me. I drive the short distance to the vacation rental using Google Maps navigation on my iPhone, but it still takes me a couple of tries to find the place. 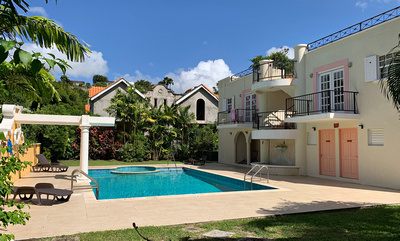 Street number addresses are not often used in Barbados, but I eventually find the 10 Springcourt vacation rental after asking a man walking the New Rockley Road for directions. I meet the rental representative there, and pay for the 4-nights. After I unpack and get settled, I have a beer and some chips while I run some clothes through the in-suite washing machine. It’s a nicely-configured studio suite that meets my needs perfectly. The 5,000-passenger MSC Preziosa docks before we anchor, so their passengers are crowding the dock area and the downtown. Some of us walk the few blocks to the town, where there are festivals and busy open air markets. I soon return to the ship to escape the heat and chaos. An excursion is late returning passengers to the ship, so we depart Kingstown at 2:00PM instead of 12:30PM. I’m concerned, since I have an excursion scheduled for a 2:15PM departure from Bequia, the next island. The Cruise Director assures us the excursion will run, since it is a short trip to Bequia. I try some roast suckling pig for lunch. The crackly skin is pretty tough and the meat is dry, so I use some gravy to make it edible. There is a 30 knot wind in the harbour by lunch time, and the crossing to Bequia is exceedingly rough, with the ship rolling wildly – passengers are struggling to not crash into things and each other. Welcome to the Windward Islands! Our Magical Coast of Bequia excursion this afternoon is delayed but still leaves from Port Elizabeth as promised. It isn’t pleasant because of the high winds and being on a speed boat means we are pitching and banging wildly. The crew are constantly asking us to move to a drier part of the boat as they struggle to put up tarps to keep us from getting completely soaked. Nobody can hear the narration describing the sights we are passing because of the roar of the engines and the strong wind. Moon Hole is one location where the waves and wind subside, so we can actually take some photos and hear the fascinating story behind the place. 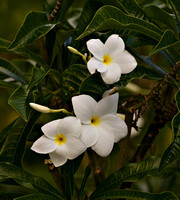 Nearby is an old whaling station at Sempler’s Cay. Apparently residents of Bequia still have the right to take a whale or two each year, but it hasn’t happened for awhile. We also go around West Cay to see the airport (unimpressive) before retracing our route. 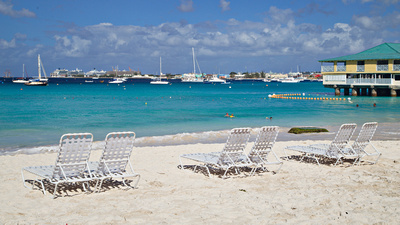 The last stop before we return to the ship is to swim and snorkel at Princess Margaret Beach. Due to the late start, it is almost sunset by the time we arrive, so it is pointless for me (and others) to go in the water, since we won’t see anything and we only have 20 minutes. Some go in for a swim anyway, while the rest of us stay aboard and enjoy the rum punch. 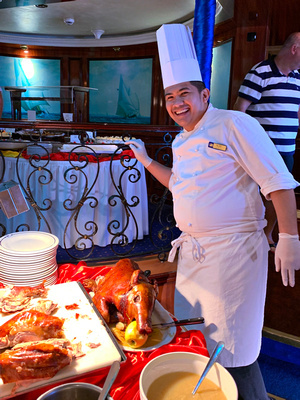 The ship’s servers and kitchen staff all parade through the dining room at dinner this evening, and sing “We Are The World” waving flags as the rest of us wave our napkins. Tomorrow the cruise is over – we dock in Bridgetown, Barbados. After returning to my cabin, I pack everything in my big travel bag, and put it out for the porters to take ashore tomorrow morning. I’m feeling a bit nauseous due to the extreme pitching of the ship as she takes the strong winds on the nose. Once I finish packing and go to bed I am fine, and sleep well. 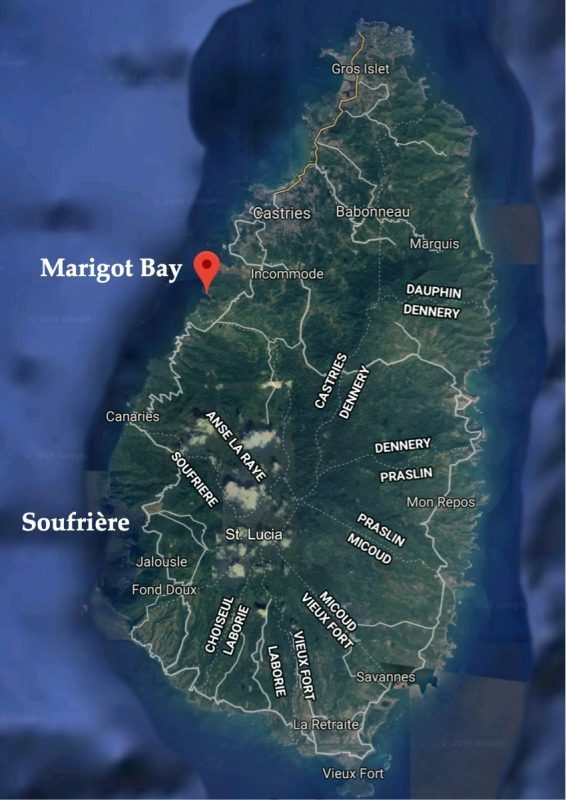 This morning, our first port-of-call is Marigot Bay, which is basically a yacht harbour. I don’t find this port too interesting, so I take the next tender back to the ship. After a couple of hours, we raise anchor and proceed to Soufrière, our second port for today on St. Lucia, arriving after lunch. 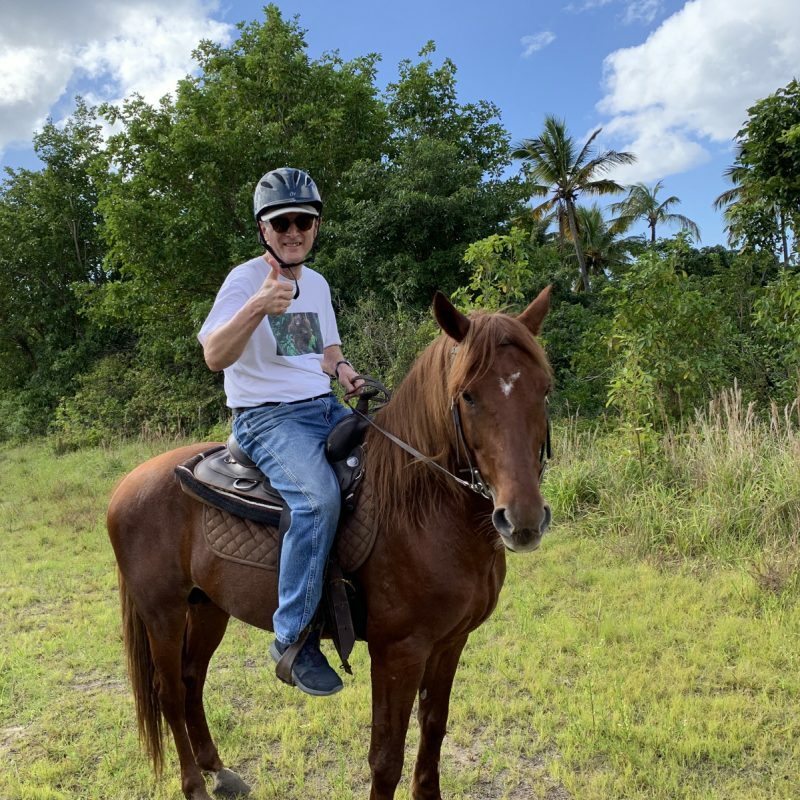 I’m on the Soufriere Morne Choval Horse Ride excursion this afternoon, which is a lovely way to spend an afternoon on St. Lucia. There are only four of us on the excursion, and it’s only a five minute drive up the hill out of town to the Morne Coubaril Estate Reserve. We spend a little over an hour riding around the estate, and then we have some snacks and drinks after the ride. 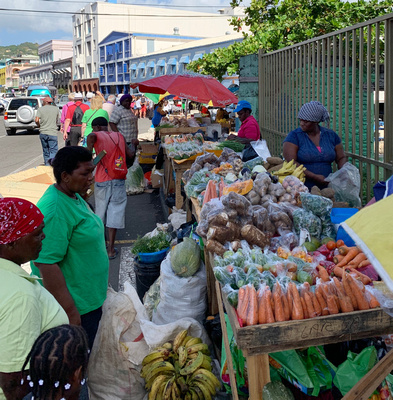 They have some nice things for sale in their shop, and they also offer zip-lining, estate tours, and horseback riding to the volcano and beach. We have an opportunity to photograph the Royal Clipper from the tenders while she is under full sail departing Soufrière at sunset (see banner image above). Now I know how passengers take those terrific photos of the ship! I also observe the Green Flash from the launch, and for the first time manage to take some photos of it, although they aren’t great. After we are underway, the Captain’s Dinner is served in the dining room this evening: Chateaubriand, baked Alaska (just Neapolitan ice cream with cherry sauce), and bubbly to toast with. The Captain comes around to each table to toast and chat with us in person – a very nice touch! I have breakfast with two women who are travel friends, and decide to go ashore with them to look around Cabrits. We are on the first tender just before Noon. As it turns out, we are in a National Park, which charges US$5 each for admission to the trails and facilities, however none of us are interested in hiking in the tropical heat. We talk to a couple of taxi drivers who approach us, and eventually retain Patrickson Wallace. Our original plan was to wander around the nearby small town, but there really isn’t much there. He offers to take us on a short tour for a reasonable fare in US$, which we agree to, providing he returns us to the tender dock by 4PM at the latest. 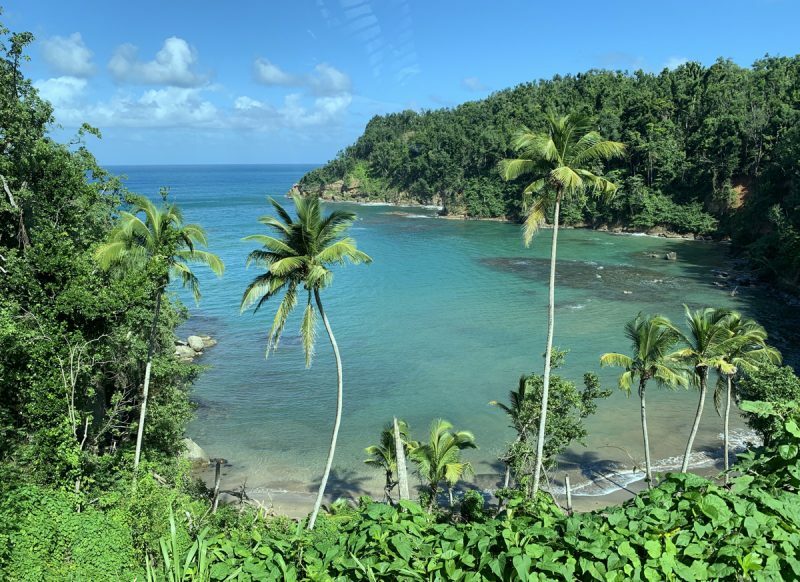 We drive north across the island through the tropical rainforest, passing through many small communities and the Indian River, one of 365 rivers on Dominica. There is damage from Hurricane Maria apparent everywhere, even inland. 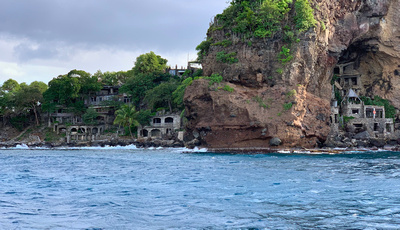 The north coast of Dominica is particularly beautiful, so we stop at viewpoints along the way before arriving at Pointe Baptiste Estate chocolate factory in Calibishie. This quaint establishment is off the beaten path, but it turns out to be a treasure for the three of us, who appreciate the tour given by a Dominican woman. 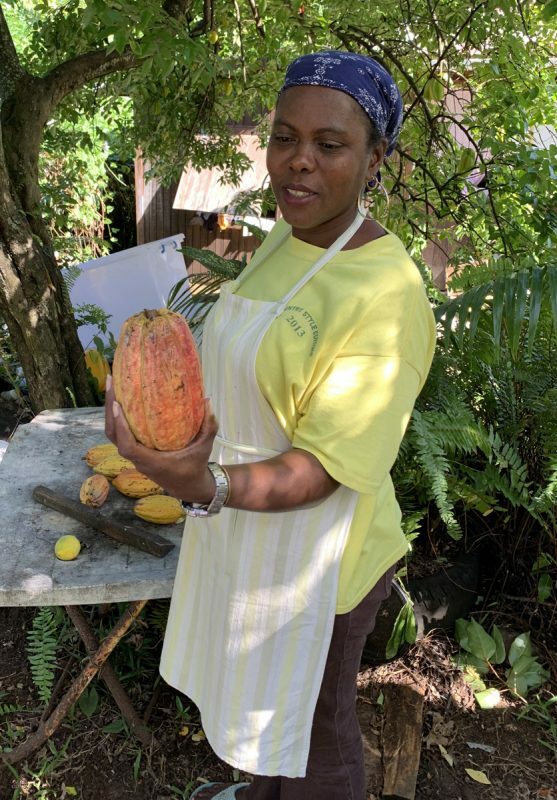 She shows us the cocoa fruit, how they ferment and air dry the cocoa beans, grind and combine the cocoa with the other ingredients, and finally make the result into chocolate bars. Each of us buy two chocolate bars of various flavours and give the woman a small tip as well. Patrickson drives us back along the same scenic route. It turns out to be a very nice tour which we all enjoyed, and we are back at the tender dock by about 3:30PM. We pay him the agreed-to fare and also give him a tip for his “building fund” for house repairs, as we say our goodbyes. Once I’m back on board the ship and get cleaned up, I take my MacBook Pro up to the Tropical Bar and have a beer as I work on my photos and journal. For the first time on this cruise, I take advantage of the afternoon snack served at 5PM in the Tropical Bar, since I had no lunch today. Despite normally ordering cappuccinos, today I finish off with two cups of brewed coffee, which tastes pretty good too! Ile des Saintes is a tiny bit of France that happens to be in the Caribbean. There are fast passenger ferries zooming into the harbour at Terre de Haut as the Royal Clipper sets anchor. I’m on the first tender to the beach, and spend the whole morning relaxing in a beach chair, swimming and snorkelling. There are reefs at both ends of the beach, where I take some pretty good underwater video and photos. I return to the ship for a late lunch, a shower, and an afternoon nap. This is the life! I take the launch into the little town in the afternoon when it cools down a bit. It’s a cute place and another French department, so there are some pretty fancy shops on the main street aimed at high-end travellers. I take a few photos, but I’m on the next tender back to the ship. We are treated to a beautiful sunset as we leave the harbour, bound for the island of Dominica tomorrow.